Tougaloo College is one of the United States’ premier historically black colleges and universities. The American Missionary Association (AMA) founded Tougaloo in 1869. Early in that year the AMA had commissioned Allen P. Huggins, a former Union officer, to look for land for a normal-agricultural school. He found the former plantation of John Boddie about seven miles north of Jackson, Mississippi and negotiated to buy it from its owner, George McKee, for $10,500. The money for the plantation was provided by the Freedman’s Bureau. In 1871 the Mississippi State Legislature granted the school a charter with the name “Tougaloo University.” In 1892 the state discontinued funding but the Normal Department was recognized as a teacher training school. College credit first became available in 1897, but qualifying for accreditation by the Southern Association took a number of years to achieve. Improvements in the library, academic degrees for teachers, and endowments led to state accreditation in the 1930s. With this, graduates who had taken 18 semester hours of education courses were granted a lifelong professional teaching license. Tougaloo had again undergone a name change in 1916 to Tougaloo College. In 1954 Tougaloo College merged with the Southern Christian Institute (SCI) in Edwards, Mississippi, because the two schools had similar missions and goals. The new school was called the Tougaloo Southern Christian College, but in 1962 was once again renamed Tougaloo College. Tougaloo was very active in the Civil Rights Movement of the 1960s and maintains a reputation for strong social commitment. 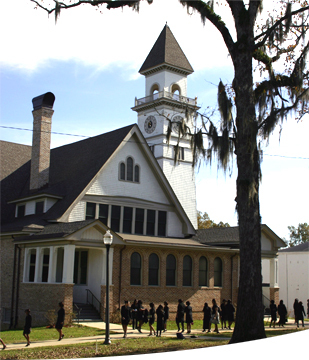 Today Tougaloo, with approximately 1,000 students, is a private, coeducational, four-year, liberal arts university. It has a selective admittance rate, but is committed to providing those from challenging circumstances with a good education. The student population is primarily African American, but all are welcome to apply. Nearly 40% of the practicing African American physicians and dentists in the state of Mississippi are Tougaloo graduates, and 35% of all current Mississippi educators are. More than 66% of Tougaloo graduates enroll in graduate or Ph.D. programs immediately after graduating. Tougaloo has won national respect for its high academic standards. Clarice T. Campbell and Oscar Allan Rogers, Jr., Mississippi: The View From Tougaloo (Jackson, Mississippi: University Press of Mississippi, 1979); Tougaloo College (official website), https://www.tougaloo.edu/about-tougaloo-college/our-history; Soul of America: Tougaloo College, http://www.soulofamerica.com/tougaloo-college.phtml; US NEWS Best Colleges 2010: Tougaloo College, http://colleges.usnews.rankingsandreviews.com/best-colleges/tougaloo-college-2439.